Pho. It’s like comfort in a bowl. Make it a Chicken Pho and I imagine that this is the Vietnamese version of Chicken Noodle Soup. Except it has better depth and a different flavor pallet. Don’t get me wrong, some chicken noodle soup can be good…but if you gave me a choice of Chicken Noodle Soup or Chicken Pho…well, sorry America. Growing up, my family liked to eat at a lot of different restaurants and try different cuisines. I am thankful for that and will always have warm thoughts about getting together and catching up over Dim Sum. So when I opened my Christmas gift from my cousin Abby, I was excited to find a copy of Vietnamese Home Cooking by Charles Phan. I was instantly drawn to all the beautiful photographs and once I started reading some of the stories behind the dishes, I couldn’t wait to try them all. This Chicken Pho was the perfect cure to a bad case of the rainy day blues I was rocking earlier this week. I was down on myself and just couldn’t get out of my own head. So a little comfort food — even if it came in the form of Vietnamese comfort food — was just what I needed to de-funkify myself. I love that with Pho, it can kind of be a make your own bowl of soup. With all the different toppings you can add, every persons bowl at the table can be a little different. I, of course, wanted to use ALL of the possible toppings…but some people might just want some crispy fried shallots and spicy jalapeños. Make it your own and enjoy! In a large stock pot, bring chicken stock to a boil over high heat. Add ginger and fish sauce to taste. Ready the garnishes. Arrange cilantro, fried shallots, bean sprouts, limes and jalapeño slices on a platter and place on table for easy access. Divide the rice noodles evenly among bowls. Top each serving with about 3/4 cup shredded chicken, then divide the cilantro and green onions evenly among the bowls. Ladle the hot stock over the top, dividing it evenly. Serve immediately, accompanied with the platter of garnishes. « Previous PostDIY Terrarium for under $50! 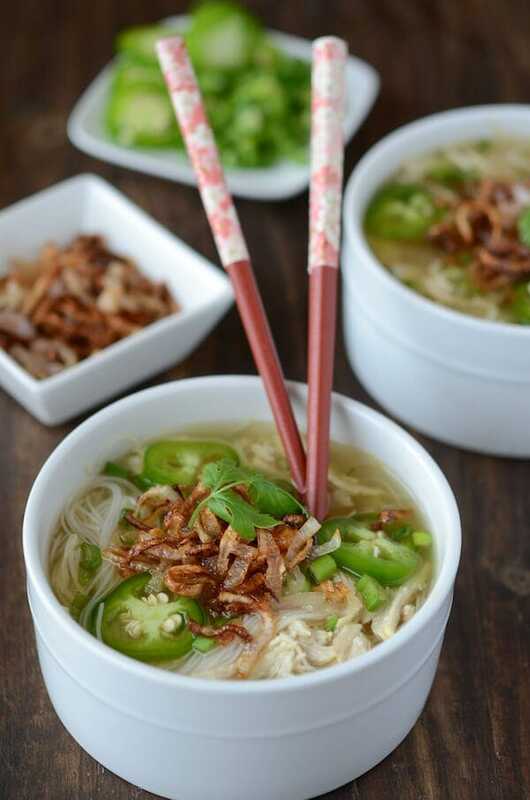 I adore pho and make it almost 2-3 times a month. It is so comforting and satisfying!! Love your version with the crispy shallots. For real, my mouth just watered. I love a good chicken soup…and this one is just totally bursting with flavor!!!!!!!! what a wonderful and simple recipe, definitely bookmarking! Thanks for sharing this recipe. I can almost hear you gasp when I say I’ve never had the pleasure of trying pho. I’m on the hunt….but I’m also scared away by all the phos out there that can be full of cr*p. I want the good stuff, the real stuff…and this bowl looks INCREDIBLE!! You make it sound easy and attainable…even for those who have never sampled it before. So thanks!! I could eat pho for every single meal and never tire of it!! This looks incredible! This looks so comforting, Jessica. I love the photos! I love pho, although I usually have the beef version. Will have to try pho with chicken soon. This recipe looks so delightful as well as light. I must try it. It does look so simple yet delish. 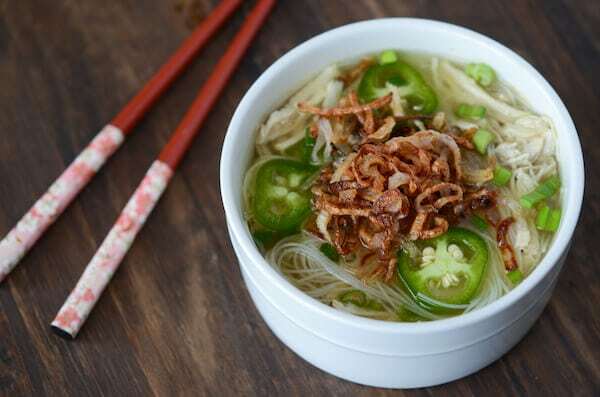 Omg this beats the crap out of chicken noodle soup – and I am drooling over those fried shallots. Definitely putting this on the must make list for this winter 😀 yum! I love Pho! My family used to watch all the PBS cooking shows on weekends. We always loved the Vietnamese cooking show. Your version is so easy going, I love this! Do you have a good, easy recipe for beef pho? I love it so much, but every recipe I’ve found online requires making your own stock with the marrow. I’m not really up to that. Sorry Whitney, I don’t. But the cookbook has a beef pho recipe! It’s definitely worth buying! This turned out fabulous! thank you for posting recipe. Made a few tweaks to accommodate what I had on hand, but your recipe inspired me! Will be making this a part of our meal rotation for sure! Pho requires star anise and cinnamon, beware if left in too long it can over power the flavor of the broth. Found your recipe on foodgawker & made this for dinner a few days ago – was fantastic, really light & fresh. Will certainly be cooking this again! Made this tonight…delicious and easy! !